CHICAGO – In the latest HollywoodChicago.com Hookup: Film, we have 15 pairs of guaranteed fast-pass virtual reality tickets (skip the lines!) up for grabs to the immersive 4D virtual reality experience “Insurgent: Shatter Reality” at Navy Pier in Chicago! Note: Our winners can bypass the lines and go directly to the front! “Insurgent: Shatter Reality” is set in the world of the film and immerses users into the role of “Divergent” members of society who have been captured by Jeanine Matthews (Kate Winslet) and her Erudite faction. Users are subjected to a series of mental simulations in order to determine the full extent of their divergence. You will experience two distinct, intensely gripping and realistic fearscapes that transport you from the frightening heights of a crumbling Chicago skyscraper to the intimidating challenge of a massive, fast-approaching locomotive. The 4D experience features a themed mobile environment including rumble chairs, computer-controlled fans and more. tickets to the 4D virtual reality experience before the film releases. Following “Divergent,” “The Divergent Series: Insurgent” opens in theatres on March 20, 2015. The film features an all-star cast including Shailene Woodley, Ansel Elgort, Theo James, Kate Winslet, Naomi Watts, Miles Teller, Jai Courtney, Zoë Kravitz, Maggie Q, Octavia Spencer, Ashley Judd, Mekhi Phifer and Ray Stevenson from director Robert Schwentke and writers Brian Duffield and Akiva Goldsman based on the novel by Veronica Roth. To win your free “Insurgent: Shatter Reality” fast-pass tickets courtesy of HollywoodChicago.com, just get interactive with our social media widget below. That’s it! These tickets are valid for Sunday, March 8, 2015 any time between 10 a.m. and 6 p.m. near the entrance of Navy Pier in downtown Chicago. The more social actions you complete, the more points you score and the higher yours odds of winning! Completing these social actions only increases your odds of winning; this doesn’t intensify your competition! Lionsgate and Samsung Electronics America have teamed up to create the exclusive virtual reality experience “Insurgent: Shatter Reality”. The four-minute visual work of art is a fully immersive, 360-degree narrative experience set in the world of the new film “The Divergent Series: Insurgent”. The VR experience features stars from the film including Academy Award winner Kate Winslet, Miles Teller and Mekhi Phifer. 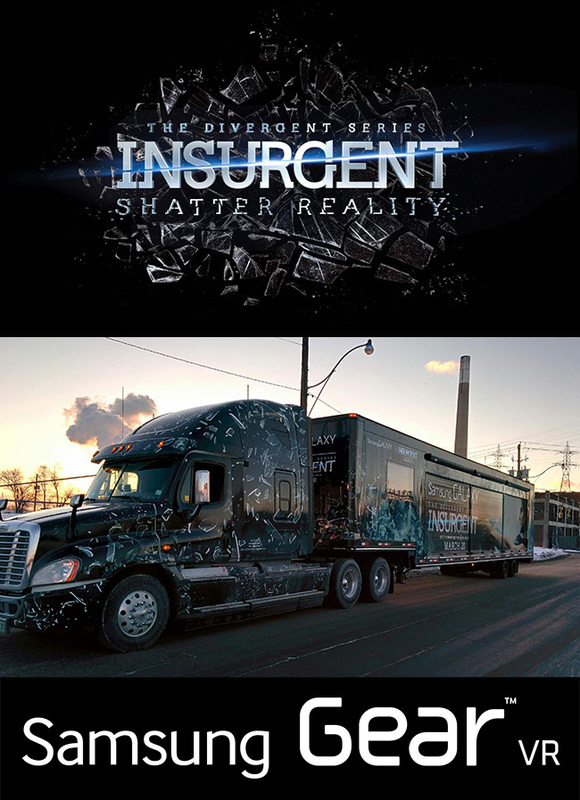 Starting on Feb. 27, 2015, fans can experience the VR content exclusively through Samsung Gear™ VR powered by the Galaxy Note® 4 as “Insurgent: Shatter Reality” goes on tour in New York, Chicago, Los Angeles, Austin and San Francisco prior to going live across all platforms and app stores. Fans outside the tour markets will have an opportunity to view the experience on Samsung Gear VR over the weekend of March 7 and 8 at select Best Buy® stores across the U.S. The 4D virtual reality experience “Insurgent: Shatter Reality”. This HollywoodChicago.com Hookup is simple! Just get interactive in our social media widget above. We will award 15 pairs of fast-pass virtual reality tickets based on social entry numbers and/or randomly via e-mail for our “Insurgent: Shatter Reality” Hookup. Good luck! Your entry in this Hookup warrants your understanding of and agreement with these terms. HollywoodChicago.com LLC is a promotional partner with the studio and its partners and does not assume any liability for this giveaway. HollywoodChicago.com is not responsible for errors or omissions entered in user submissions. Comments are closed in this Hookup.